New York native Roberta Harding received her Juris Doctorate from the Harvard Law School in 1986. Five years later she joined the College of Law faculty, becoming the College’s first female African-American professor as well as its first legacy professor. Her father, Robert E. Harding Jr., the second African-American to graduate from the College of Law, received his Juris Doctorate in 1957. Professor Harding is a nationally and internationally known expert on the death penalty. She was invited to be a Visiting Scholar at Oxford University’s Centre for Criminological Research where she researched capital punishment issues and lectured at All Soul’s College. She has lectured locally, nationally, and internationally, including in England, France, and Israel, about the death penalty and other criminal law topics. Since 1990 Professor Harding has been involved with capital litigation as trial, appellate, and post-conviction counsel for the defendant and also as a consultant. In 1997, pursuant to her request, the Italian Parliament enacted legislation requesting then Kentucky Governor Paul Patton to commute her client Harold McQueen’s death sentence. Professor Harding is a Legal Expert and Analyst for TRUTH, JUSTICE AND THE AMERICAN LIE item 52, a Netflix Original Series that investigates a claim of actual innocence in a Nebraska capital case. The multi-episode film is being made by Middlewest Studios. She’s also appearing in an upcoming episode of the CNN television series Death Row Stories. Capital punishment and criminal law and popular culture are Professor Harding’s primary research interests. Her most recent article, Rubbing the Rabbit’s Foot: Gallows Superstitions and Public Healthcare in England during the Eighteenth and Nineteenth Centuries, will be published the summer of 2016 in the Boston University Public Interest Law Journal. See Roberta M. Harding, Rubbing the Rabbit’s Foot: Gallows Superstitions and Public Healthcare in England during the Eighteenth and Nineteenth Centuries, 25, no. 2 Boston University Public Interest Law Journal 353 (Summer 2016). Other law journals that have published her scholarship include the University of Texas School of Law, Review of Litigation, the University of Georgia Journal of International and Comparative Law, the University of San Francisco Law Review, and the Buffalo Law Review. Her writings can be found in chapters in The Death Penalty, Vol. I., edited by Professor Austin Sarat, and Law and Popular Culture published by Oxford University Press. 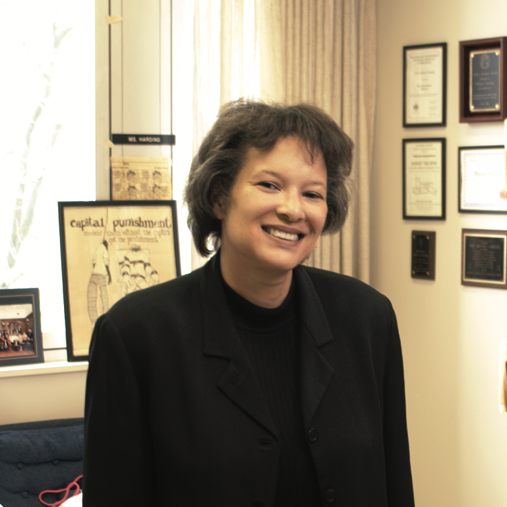 Because of Professor Harding’s expertise in capital punishment the American Civil Liberties Union of Kentucky asked her to be one of the 60 participants in the 2015 Faces of Liberty Project, which profiles individuals who have played important roles in protecting the civil, political and legal rights of all people. See http://www.aclu-ky.org/wp-content/uploads/2015/11/303088_Inside.pdf, at 32. Other awards Professor Harding has received include the University of Kentucky President’s Faculty Award for Diversity, the College of Law’s Robert M. and Joanne K. Duncan Faculty Award for Teaching, and the Public Advocate Award from the Commonwealth of Kentucky’s Department of Public Advocacy. Professor Harding’s research interests are evident in the courses she teaches. She teaches an introductory Criminal Law course to first year law students and Capital Punishment and Race, Racism, and the Criminal Law to second and third year law students. She also teaches Animal Rights, an upper level course. Professor Harding was instrumental in launching the College of Law’s nationally recognized Innocence Project Externship and served as the Externship’s Faculty Supervisor for more than a decade. Prior to joining the faculty Professor Harding practiced law in San Francisco, California at Pillsbury, Madison & Sutro and at McCutchen, Doyle, Brown & Enersen. She also started and co-owned two businesses in Rome, Italy: Legal English Associates and Legal Seminars International. Capital Punishment and Race Discrimination, in The Encyclopedia of American Civil Liberties (Daniel O. Conkle & Steve Sanders eds., 2006). Capital Punishment: Methods of Execution, in The Encyclopedia of American Civil Liberties (Daniel O. Conkle & Steve Sanders eds., 2006). Celluloid Death: Cinematic Depictions of Capital Punishment, in The Death Penalty: Influences and Outcomes (Austin Sarat ed., 2005) (originally published 30 U.S.F. L. Rev. 1167 (1996)). Reel Violence: Popular Culture and Concerns about Capital Punishment in Contemporary American Society, in Law and Popular Culture (Michael D. A. Freeman ed., 2005). Pennoyer v. Neff: A One Act Play, in Teaching the Law School Curriculum (Steven Friedland & Gerald F. Hess eds., 2004). Scholarship can be downloaded at Roberta M. Harding's SelectedWorks page. Rubbing the Rabbit's Foot: Gallows Superstitions and Public Healthcare in England During the Eighteenth and Nineteenth Centuries, 25 B.U. Pub. Int. L.J. 359 (2016). Life and Death in Kentucky: Past, Present, and Future, 102 Ky. L. J. Online (2014), http://www.kentuckylawjournal.org/online-originals-2/life-and-death-in-kentucky-past-present-and-future/. Prosecutorial Misconduct in Capital Cases in the Commonwealth of Kentucky: A Research Study 1976-2000, 6 Ky. Just. & Safety Res. Bull. 1 (2004) (with Bankole Thompson). Gallery of the Doomed: An Exploration of Creative Endeavors by the Condemned, 28 New Eng. J. on Crim. & Civ. Confinement 195 (2002). Capital Punishment as Human Sacrifice: A Societal Ritual as Depicted in George Eliot's Adam Bede, 48 Buff. L. Rev. 175 (2000). The Enforcement of Prisoners' Rights in the United States: An Access to the Courts Issue, Cov. L.J. 3(1), 10-16 (1998). In the Belly of the Beast: A Comparison of the Evolution and Status of Prisoners' Rights in the United States and Europe, 27 Ga. J. Int'l & Comp. L. 1 (1998). The Gallows to the Gurney: Analyzing the (Un)Constitutionality of the Methods of Execution, 6 B.U. Pub. Int. L.J. 153 (1996). At Loggerheads: The Supreme Court and Racial Equality in Public School Education after Missouri v. Jenkins, 2 Race & Ethnic Anc. L. Dig. 26 (1996). Celluloid Death: Cinematic Depictions of Capital Punishment, 30 U.S.F. L. Rev. 1167 (1996). "Show and Tell": An Analysis of the Scope of the Attorney-Client Waiver Standards, 14 Rev. Litig. 367 (1995). Endgame”: Competency and the Execution of Condemned Inmates—A Proposal to Satisfy the Eighth Amendment's Prohibition against the Infliction of Cruel and Unusual Punishment, 14 St. Louis U. Pub. L. Rev. 105 (1994). Waiver: A Comprehensive Analysis of a Consequence of Inadvertently Producing Documents Protected by the Attorney-Client Privilege, 42 Cath. U. L. Rev. 465 (1993). Professor Roberta Harding came to CELT with an idea: She wanted to reimagine how students in her criminal law course approached casework while focusing on critical reading, strong analysis, and fact-based reasoning. Professor Roberta Harding, Judge William T. Lafferty Professor of Law, was recently profiled by the American Civil Liberties Union (ACLU) of Kentucky as one of their “Faces of Liberty.” To mark their 60th anniversary, each week through December 2015, the ACLU of Kentucky will feature a member, client, case, board or staff member who has been “an integral part” of the organization’s rich history. The following article has been reprinted with permission from the American Civil Liberties Union of Kentucky.